An ACK-PSH-FIN flood is a DDoS attack designed to disrupt network activity by saturating bandwidth and resources on stateful devices in its path. By continuously sending ACK-PSH-FIN packets towards a target, stateful defenses can go down (In some cases into a fail open mode). This flood could also be used as a smoke screen for more advanced attacks. This is true for other out of state floods too. ACK-PSH-FIN Packets are considered an illegal packet by the Original TCP RFC. While it left room for customized behavior it is virtually unused today. Thus different systems can react differently to these packets and may cause unexpected issues and behavior. Below an analysis of an ACK-PSH-FIN flood is shown. The following images depict a high rate of ACK-PSH-FIN packets being sent from a single source IP towards a single destination IP. In Image 1 below, you can see the flood of ACK-PSH-FIN packets coming from a single source. Notice the rate at which the packets are sent. Sometimes, depending on the target’s implementation of the TCP stack, a RST packet may be returned as can be seen below. In Image 2 you can see the victim responding with an RST packet. The reason this RST packet is received in response to the original ACK-PSH-FIN packet is because the TCP stack receiving the ACK-PSH-FIN packet never had a corresponding sequence of SYN – SYN+ACK +ACK (Otherwise known as the TCP handshake). Some environments may opt not to send a RST packet back to the source of the offending ACK-PSH-FIN packet. The ACK-PSH-FIN packet is known as an out of state packet. 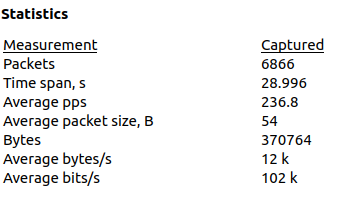 As seen in Image 3 the capture analyzed is 29 seconds long and the average number of packets per second are at 236, with a rate of around 102Kbps. Attack rates could be much higher. A typical ACK-PSH-FIN flood running against an unsuspecting host will look similar to the above analysis. Generally what is seen is a high rate of ACK-PSH-FIN packets (not preceded by a TCP handshake) and a slightly lesser rate of RST packets coming from the targeted server. 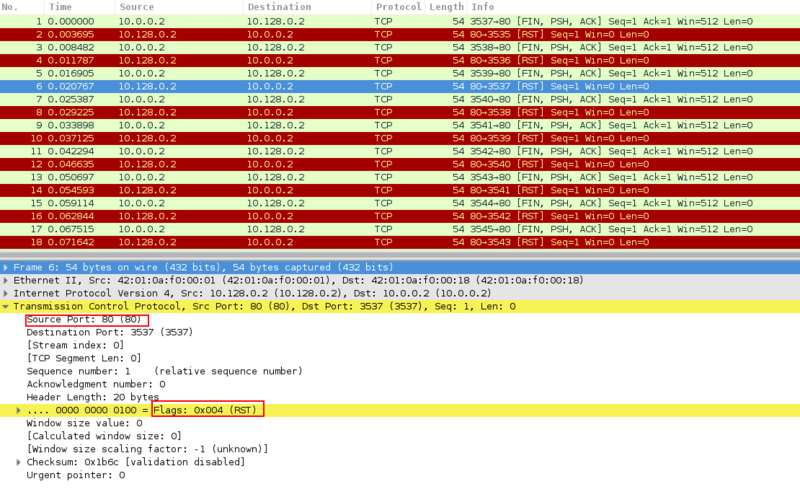 Filter ACK-PSH-FIN packets – “tcp.flags.ack && tcp.flags.push && tcp.flags.fin”.